Shelf life determination usually requires time-consuming tests. How to determine the shelf life of drugs without long testing times? First predictions about the shelf-life concerning thermal stability are achieved using thermogravimetric measurements with kinetics evaluation. This takes some hours or days. 5-year-forecast within some hours – What do you need for that? Kinetics Neo, a software that determines the kinetics of the decomposition reaction. Carry out TGA measurements at different heating rates. 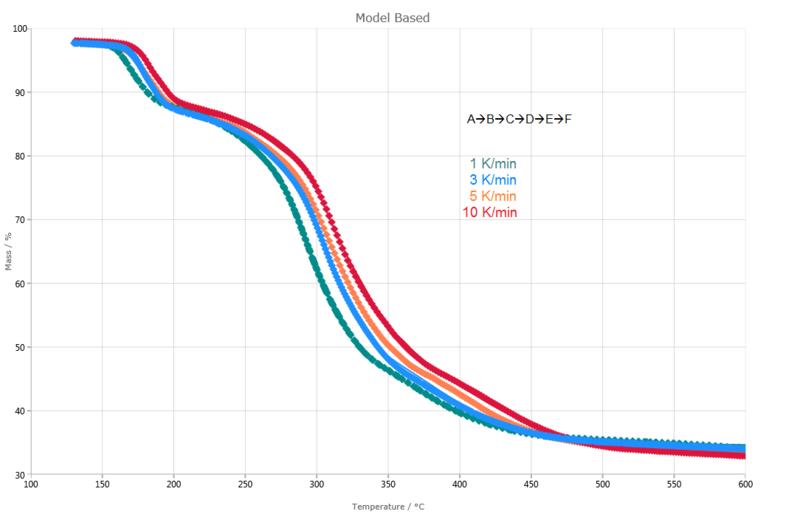 Validate the kinetic model by comparing a measurement at a isothermal temperature with the curve calculated by Kinetics Neo. Let us do it together on potassium clavulanate. This pharmaceutical substance is generally used with the antibiotic amoxicillin to increase its effectiveness. Figure 1 displays the TGA and DTG (first derivative) curves of the measurement on potassium clavulanate at 10 K/min and in a dynamic nitrogen atmosphere. The first mass-loss step, detected between room temperature and 120°C, results from the evaporation of surface water (click here for more information). Further, the three mass-loss steps identified between 120°C and 600°C are due to the decomposition of potassium clavulanate. Figure 2 depicts the TGA and DTG (first derivative) curves of the measurements on potassium clavulanate at heating rates of 1, 3, 5 and 10 K/min. The mass-loss steps are shifted to higher temperatures with increasing heating rates (kinetic influence). For example, at a heating rate of 1 K/min, the first decomposition step occurs at 167°C (DTG peak), while at a heating rate of 10 K/min, it occurs at 184°C (DTG peak). The dependence of the decomposition on the heating rate allows for evaluation of the decomposition kinetics with the help of NETZSCH Kinetics Neo software. Kinetics Neo proposes a kinetic model with five consecutive steps of nth order (click here for more information). It calculates the kinetics parameters of each step (activation energy, pre-exponential factor, …). The water release is not taken into account for the calculation. Figure 3 compares the measured TGA curves (dotted lines) with the calculated curves (solid lines) of the chosen 5-step model. The correlation between measured and calculated curves is very good! 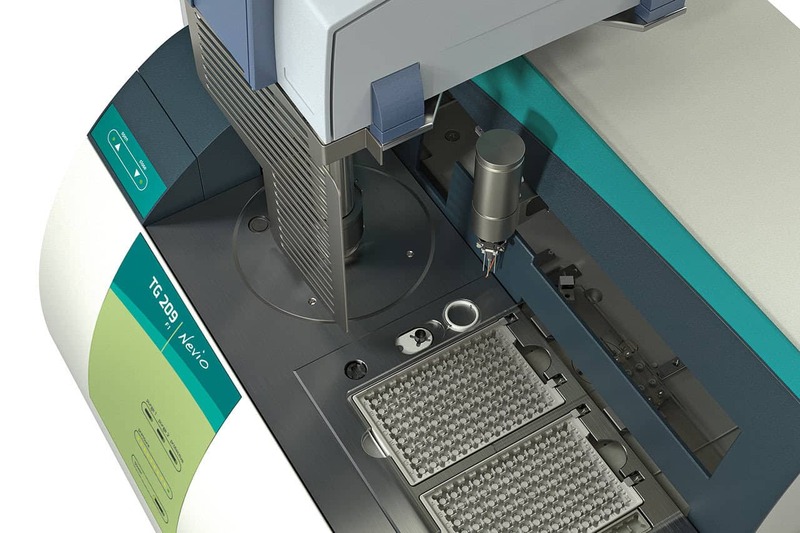 Kinetics Neo uses the calculation to predict how the sample would behave during long-time storage at different temperatures. Figure 4 displays the 5-year forecast of the decomposition process of potassium clavulanate. This plot was realized in some days, taking the measurements and evaluation with Kinetics Neo into account. The kinetic model calculated by Kinetics Neo should be validated for prediction of the decomposition behavior under isothermal conditions. For that, a potassium clavulanate sample of 9.23 mg was heated to 200°C and then kept isothermal for two hours. 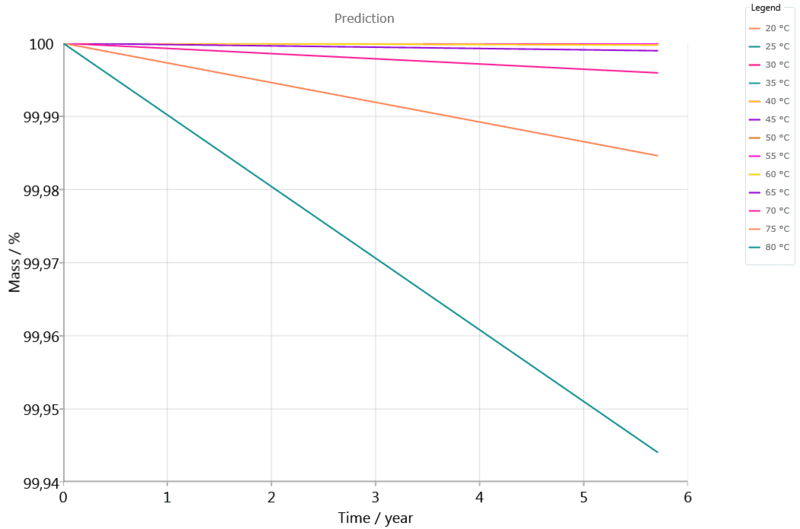 Figure 5 compares the mass losses determined via measurement to those determined via prediction (Kinetics Neo). 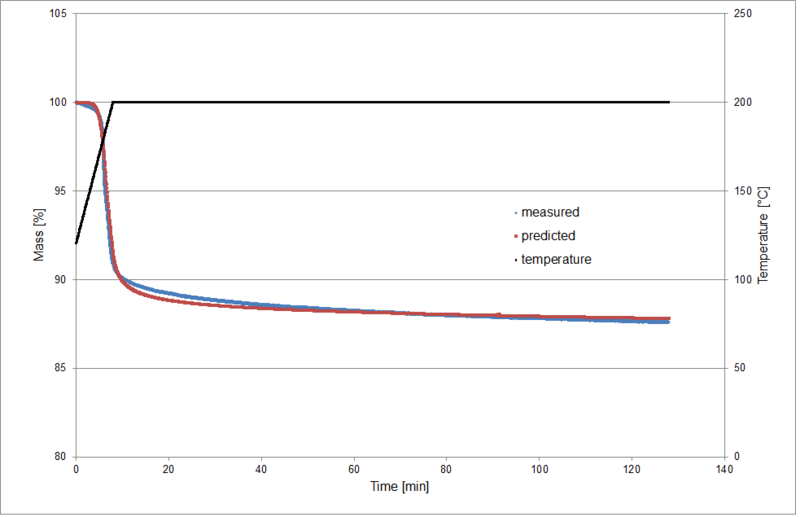 The comparison shows the good agreement between the two curves and thus the reliability of the calculation. Figure 5. 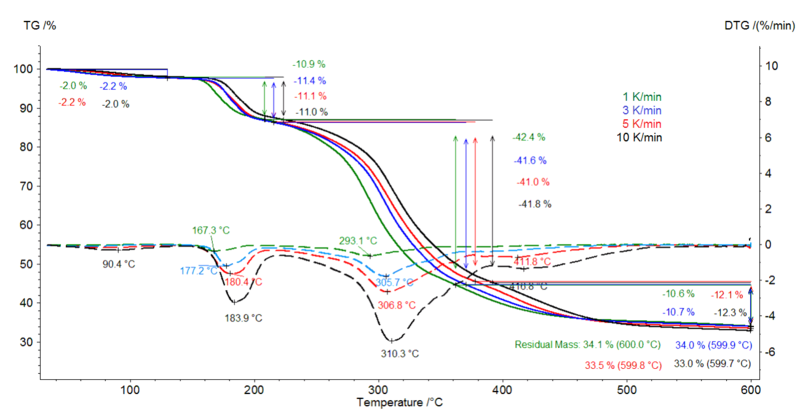 Comparison of the measured and predicted mass change of potassium clavulanate during heating to 200°C and isothermal segment; the release of surface water is not monitored.